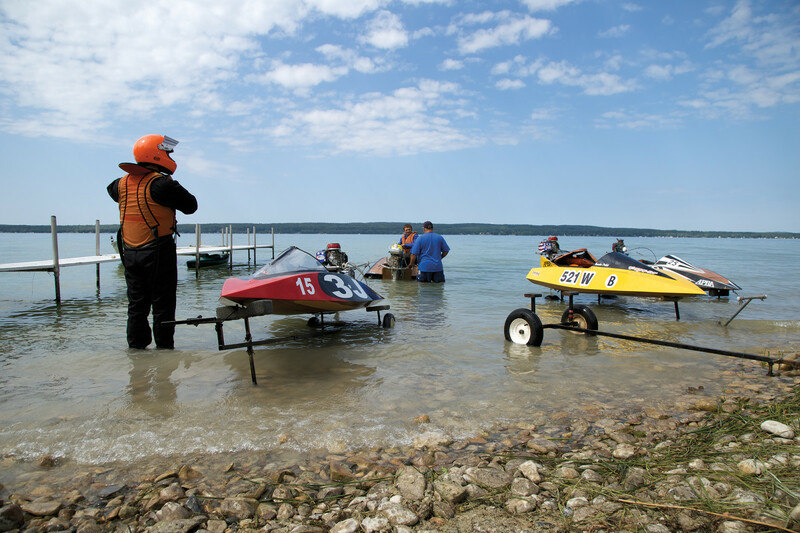 Since 1948, the world’s toughest outboard marathon draws all types to northern Michigan, where racers face off against stumps, hairpin turns, unforeseen wakes and each other. One of over 100 racers who descended on the course this year, 9W, or Nick Jenkins, hopes to win it all. But the competition isn’t far behind. It’s midday when Terry Kerr finally makes it back to the pits. 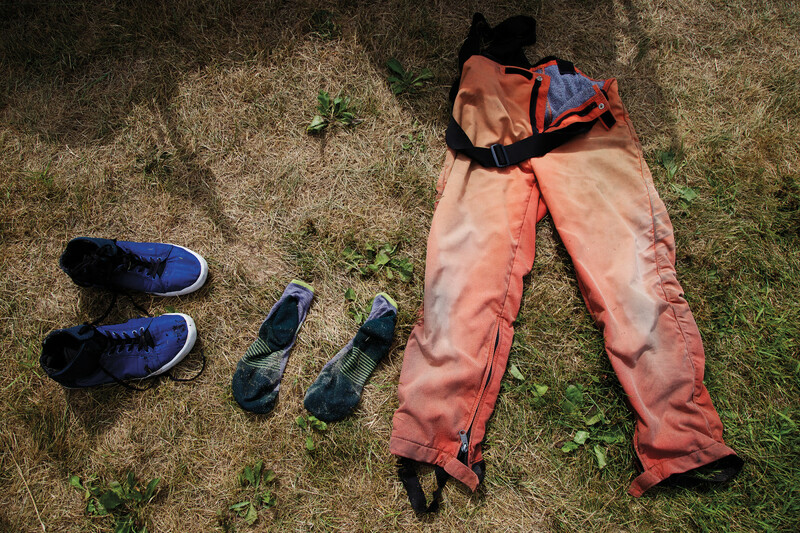 He’s exhausted, battered and bruised, soaked to the bone in lake water and sweat. He has spent the better part of his morning running over 3-foot chop in a stock outboard runabout the size of a coffin. His runabout is only in somewhat better condition. Terry thinks he hit a deadhead, and the prop needs to be hammered back into shape. He’s just run over 45 miles, sometimes at speeds in excess of 43 knots, and tomorrow he’ll wake up and do it all over again. He hands the prop to his brother-in-law, Brian Trolian. “Don’t worry about it,” says Brian. “I’ll fix it.” Brian takes it into the trailer that acts as their mobile workshop, and deftly lays some strokes to it with a ball-peen hammer: bang, bang, bang. Even 1/16 of an inch on the prop can be the difference between first and second place. But right now, Terry has bigger things to worry about—like finding a replacement for his port-side gas tank, which has suffered an irreparable puncture. “That’s Top O’ for you,” grins Terry. Pit crews help lift the runabouts out of the water while one team member rips the pullcord on old two-stroke Mercury and Yamato outboards. Then they’re off! 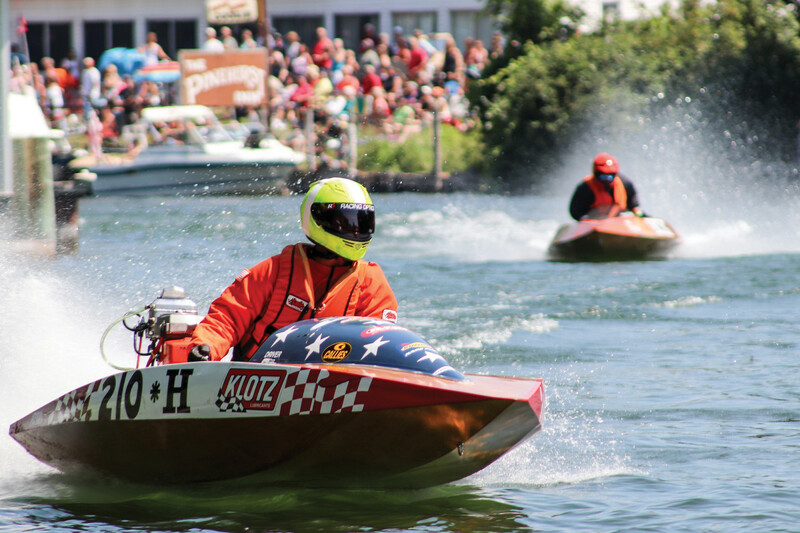 The Top O’ Michigan Marathon is the legendary annual stock outboard race, billed as “The World’s Toughest Outboard Marathon.” The course covers 87 miles through the inland waterways of Michigan’s Upper Peninsula, where drivers contend with stumps, hairpin turns and pleasure boat wakes. They also face off against each other. 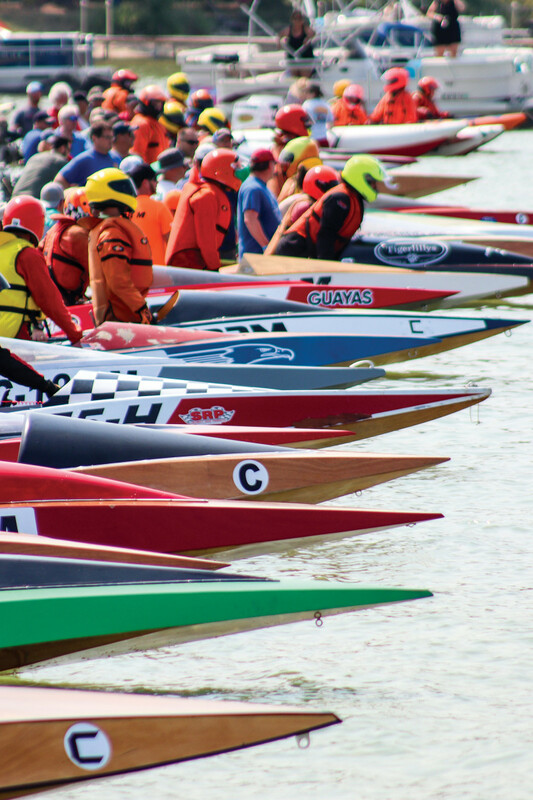 Over the course of two days, the horde of stock outboard runabouts will zip around nine make-or-break buoys; miss a buoy and you’re disqualified. August 2018 marked the race’s 70th year. To celebrate, over 100 participants—some of them first-time racers—came from all over the country, and as far afield as Ecuador, to the small, heartland town of Indian River. Young and old come to hurl themselves at breakneck speeds across the exacting course. 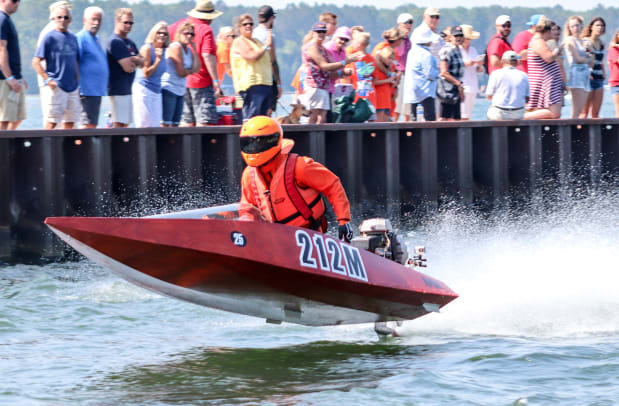 “I started racing in 1975, and I’ve never seen one hundred boats here,” says Tom Fairbairn, an Indian River local and the commodore of Top O’ Michigan Outboard Racing Club. Surviving the course is one thing. If you want to win, you’ll need a combination of endurance, resolve and quick hand-eye coordination. You also need a healthy dose of luck. Tinker, tinker, tinker. 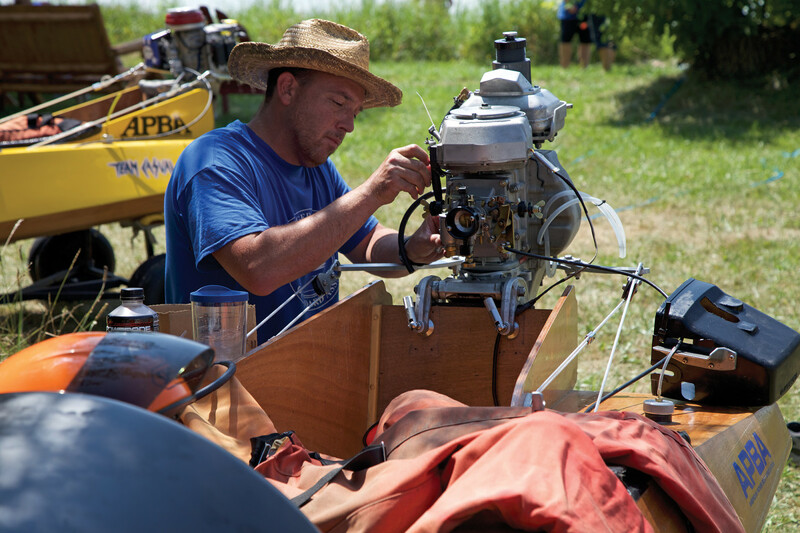 Stock outboard racing is unequivocally a sport for gearheads. Racers will fine-tune engines right up until race time. Ask any of the racers about the course, and most will speak about it with astonishment, vexation and loathing, but most of all with respect. At Top O’, drivers that typically compete in closed-course races—running multiple laps around an oval course—are forced to tussle with down-and-back racing across two lakes, Burt and Mullett. At 27 and 26 square miles respectively, they are among the largest inland lakes that dot Michigan, and they share a reputation for being unpredictable. The sport attracts its share of diehards and daredevils. 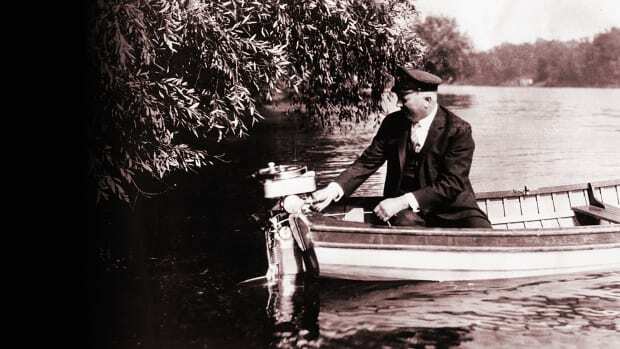 But some fear this new crop might be the last of a dying breed of stock outboard drivers. At Top O’—and other races around the world—it’s normal to see old school, two-stroke Mercury and Yamato engines hanging off transoms, as well as the modern, American-made Sidewinder. 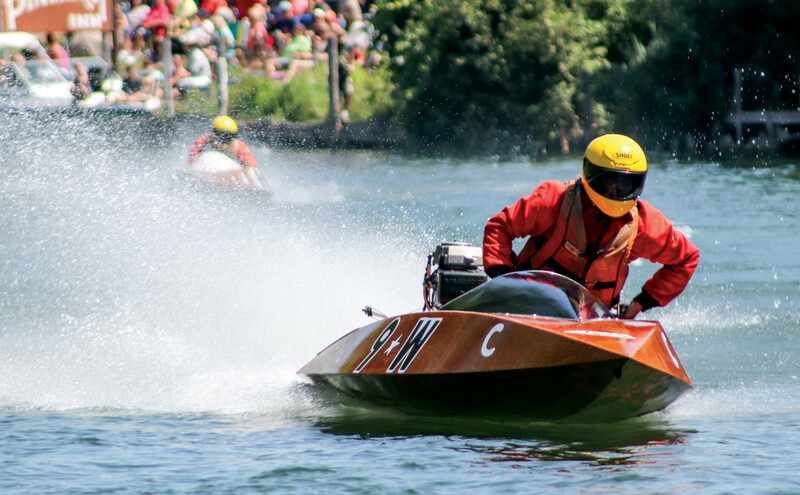 Regulated by the American Power Boat Association, this is a sport for gearheads. Out of the five classes competing, one still favors Mercury Mark 55H engines, which have been in use since the ’50s. Not only do they stoke nostalgia, but they still run great, too. 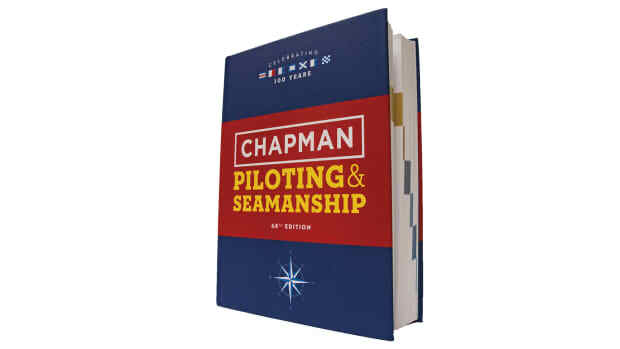 Some classes require horsepower-controlling restrictor plates to keep things competitive; but the fastest classes allow drivers to open up these mini-powerhouses, with speeds in excess of 60 knots. Terry doesn’t compete in the fastest class, but it is the most competitive. At 44 years old, he’s one of the older racers in the pack. 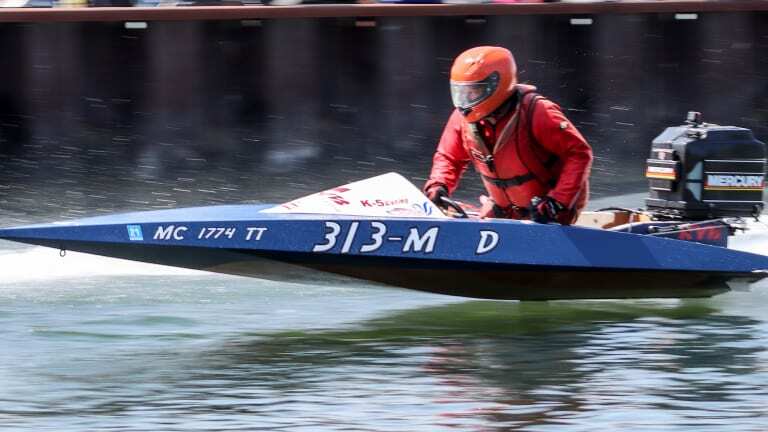 Growing up south of Detroit, he knew he wanted to be a racer like the Motor City legends before him, hydroplane and runabout champions who made a name for themselves racing on the Detroit River alongside freighters. But Terry’s introduction to the sport was Top O’. He was 16 when he first made the trip up to Indian River. Before the race, his stepfather, a longtime stock outboard driver, had some friendly words of advice. “He told me, ‘you’re either going to love it or hate it,’” says Terry. He ended up coming in dead last in his class, as if that mattered. That was 1989. He’s been coming back every year since. “It’s in my blood,” says Terry. Top O’ is maybe the last point-to-point outboard marathon in the country, and other than a regatta in Guayaquil-Vinces, Ecuador, one of the last, period. Powerboat racing once had a thriving stock outboard circuit in the U.S. 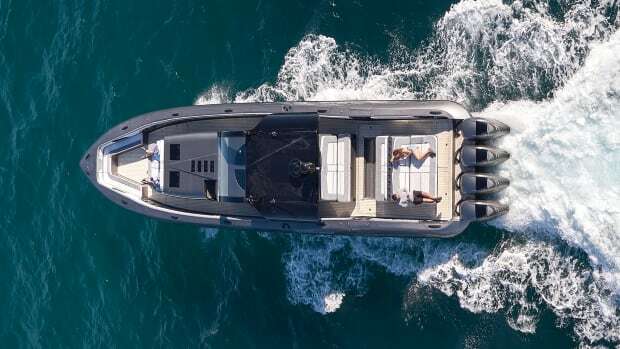 But a multitude of factors—including stricter age requirements to operate pleasure craft, and the overwhelming investment of time and financial resources—have led to a sharp drop off in interest. And then there are the logistical hurdles. The Top O’ Michigan club members take an entire year to work through permitting with 12 townships, two counties, the state’s department of natural resources and the Coast Guard. They also coordinate with the U.S. Army Corps of Engineers to open a set of locks. The bigger the course, the bigger the headache. Which says nothing of the risk of injury. Everyone seems to have a story about a family member or friend who has survived a life-threatening accident. 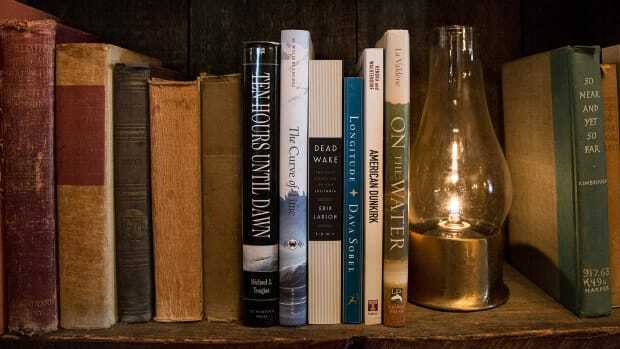 A few tell stories of their own. That includes the club’s commodore, Tom Fairbairn. Years ago, he was testing a runabout leading up to the race when he was ejected at full speed. The crash resulted in extensive nerve damage and the loss of mobility in his right arm; the injury forced him to retire from the sport. Drivers wear either one- or two-piece cut suits, as well as life jackets, helmets and eye protection to protect against the chance of collision. The day before the race begins, an idyllic scene is unfolding on the waterway that gives the town of Indian River its name. Pontoons and other boats ply the river’s no-wake zones. A couple boys in swim trunks are tossing around a football. Nearby, a young woman suns herself on a manicured lawn. This is the middle America of Norman Rockwell, of John Hughes. It seems impossible that in less than 24 hours a fleet of arrow-like speedsters will be zipping across these waters. I make a turn down a dirt road and arrive at my destination: a small clearing that opens onto Burt Lake. The campground has no sign. But I know I’ve arrived at the right place. Tents, RVs, trailers and runabouts scatter the grounds. In contrast to the carefree summer day playing out across town, this feels like I’ve stumbled across preparations for a NASCAR race. It’s morning and the lake is still, but already the buzz of engines is coming from the water. Racers flock to Camp Kurz, the marathon’s unofficial staging area, to go through their mental checklists before race time. 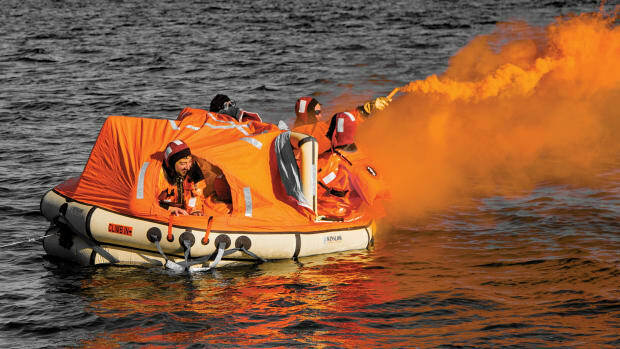 Cut suits designed to protect the wearer from bodily harm dry on clotheslines as drivers huddle close to their engines, tinkering with their outboards, before taking to the water to check rpm and prop pitch. Family members gather on the dock to watch their loved ones hurtle across the water. As I walk down to the boat launch—a rocky 8-foot gap in the reeds—I follow a young woman’s eyes that are trained on the middle of the lake. Her name is Sarah Meloche, and her boyfriend, Eric Wienczak, is out there testing his engine. Clouds of gnats conspire in the air around us. “Are you nervous for him?” I ask her. I’m wearing a borrowed cut suit and holding a canary yellow helmet. Climbing into the race-flag-checkered stock outboard provided by Bill Allen—a world champion hydroplane driver out of Boston—he gives me a thumbs up. “It should be solid for a new guy,” says Bill. “Just don’t lose sight of the pits.” I close the helmet visor and choke the deadman’s throttle. Bill rips the pull cord and the engine roars to life as I take off on a beeline toward the middle of Burt Lake. I should probably mention I’ve never driven, much less raced in, any type of runabout before. Even without much chop, it doesn’t take long to realize the physical toll this sport takes on the drivers. 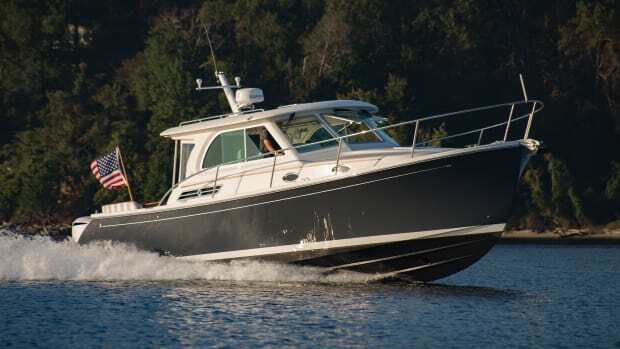 The runabout is so light—less than 400 pounds—and the helm is so close to the engine that it requires the driver to physically lean forward, like a jockey, to help disperse weight and keep the bow from lifting. Speed also helps keep the bow down, so I’m ripping it as fast as I can while keeping an eye peeled for the wake of passing boats. I’m already sore by the time I locate the pits and head in. “You did better than most,” says Bill, who got on the podium at the 2018 outboard stock Yamato hydroplane world championships in Poland. “Some people can’t even get onto plane their first time.” I rationalize his words of encouragement away: by “people,” I have a feeling he is referring to 9-year olds, the youngest possible age of entry that can race in the junior class. Still, the thrill of unadulterated speed is addictive. I ask if I can go for another joy ride. Drivers open up the old two-stroke engines on the course’s rivers, clearing 60 mph as they race between stumps, cattails and the wake of other racers. Not long after the internal combustion engine was created, man set about racing it. Auto racing came first, beginning in the late 19th century, but its waterborne cousin wasn’t far behind. In 1903, the American Power Boat Association was formed, becoming the oldest governing body in all of motor sports. By the time the first Top O’ Michigan Outboard Marathon was raced in 1949, stock outboard regattas were being staged all over the country. Back then, Top O’ was different. Instead of being broken up over two days, the 87 miles took place in the span of one. 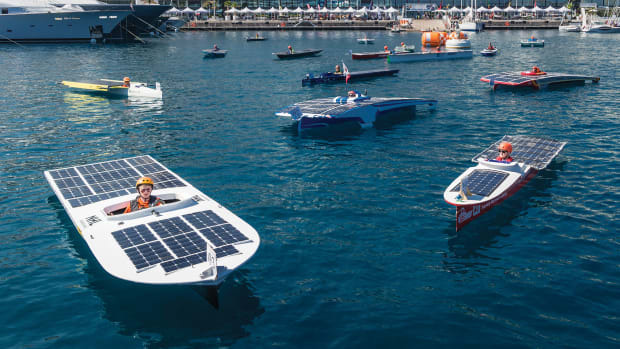 Instead of timed heats, all the boats started at the same time. And the longer course meant that the drivers had to carry more gas, which resulted in externally mounted gas tanks. It was mayhem. But it was all they knew. Ed McCourtie and his brother Jack grew up building and racing runabouts at Top O’. 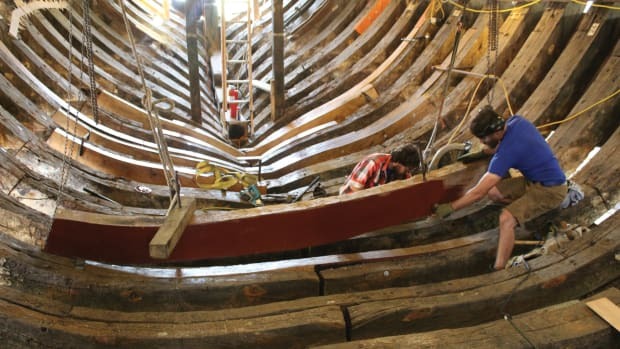 Though Ed doesn’t race anymore, he’s still building boats. Before he retired from racing he was competing against his eldest son. “When he got to the age when he could outdrive me, I gave him all my equipment because I wanted to see him win,” says Ed. On the second day of racing, Terry Kerr, Johnny Wlodarski, Samantha Fairbairn, Mike Akerstrom, Ed McCourtie’s youngest son, Steven, and the hundred other drivers don their cut suits. 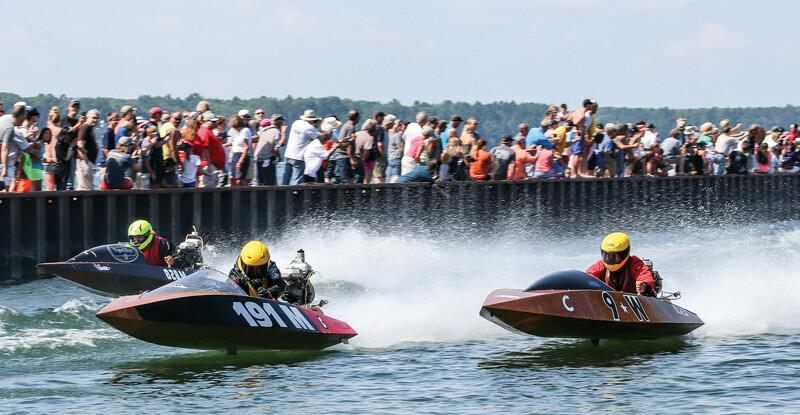 Today they are racing for all the marbles across Burt Lake, through the Crooked River with its infamous Devil’s Elbow—a turn that is sharper than 180-degrees—and a lock barely wide enough to fit a single boat. And then there’s the stump fields: submerged stumps that can rip a boat’s bottom clean off. The river can quickly become a shambolic mess as racers squeeze past each other in the narrow channel. I watch them around the halfway point from a bridge overlooking Crooked River. Spectators have spread out along the shoulder. From the bridge, you can hear the engines buzzing from far away—faintly at first, then altogether, like a swarm of locusts descending on the river. Soon enough, they’re zipping underneath us. As the racers go by, you can tell a few of them have had enough of the course by their posture: not hunched over on their knees, like a baseball catcher, but unnaturally upright. They just want to finish. In comparison, the professionals are coiled to make themselves as aerodynamic as possible. I make out Terry’s number, 52m, as he cruises by. I find out later he is desperately trying to make up lost ground to Steven McCourtie. When I find Terry at his tent, he’s in a worse mood than he was on the first day of racing. He’s finished second overall in his class, losing to Steven McCourtie. But he does have something to be proud of: After a tough start yesterday, his 15-year-old daughter, Emily, also placed second overall in the junior class. 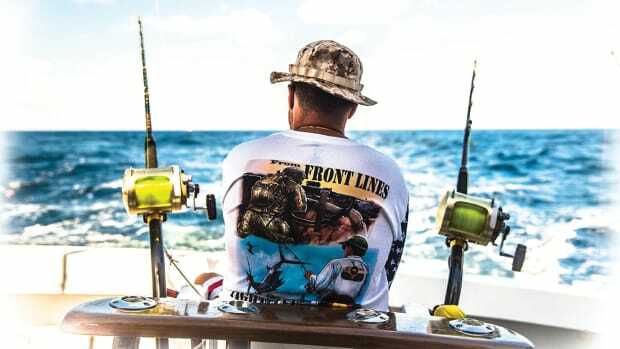 This article originally appeared in the premier issue of Outboard magazine.